Discussion in 'iMac' started by Bartmaster1234, Jan 9, 2014. My mid 2011 iMac has just recently started dipping in CPU usage and going very slow for a period of time, then back to normal. To fix the issue, I just reset the SMC controller by unplugging the iMac, and restarting it. The application thats using the most CPU is the Activity Monitor itself at an average of 2.5. Of course, after doing this every day, it gets a bit tedious. Is this a lack of RAM problem? Do you reccomend upgrading? I run a lot of high CPU consumption programs, such as rendering videos in Final Cut and high performance games. Hi. 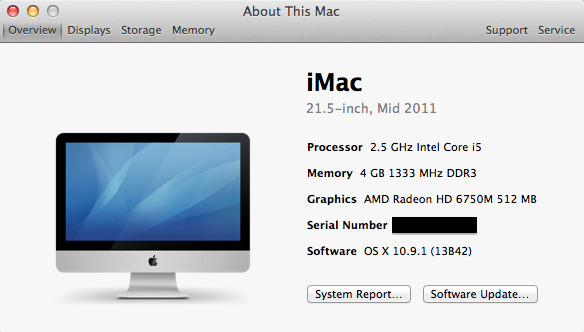 A family member of mine has the mid 2011 21.5" iMac. He got the high end though which contains 2X HDD space, faster clock speed and TB, as well as a higher end GPU. He upgraded the RAM when Macericks came out. If you go to Activity Monitor, see how many page outs / swaps you have. If you have anything above 0, get more RAM. Try checking this when you are doing nothing, doing average work, and doing heavy work. I would say it is the Ram though. If your ram has no page outs when doing heavy load, download Blackmagic speed test from the App Store to test your hard drive speed. Please post all results (page outs also) as a reply to this comment to I can help you further. Also, do you have any program's that run on start up? Looking at your setup, you should upgraded the RAM as soon as you bought your machine. At this point, max out the RAM or throw as much in it as you can afford to. There's nothing you can do about the CPU and GPU at this point but in the future, consider going the BTO option and maxing out these two things upon purchase. Also, it may help to clean install Mavericks to get all the garbage that has accumulated throughout the years and restoring from a Time Machine backup. RAM upgrade from 4 to 8 (2X4 remove your 2X2), cost my family member around £30-40. Hmm, I wouldn't just jump the ram conclusion just yet and make sure there aren't any hardware issues (run the Apple Hardware test). I only say this because I'm on Mavericks on a 2008 C2D iMac using only 4GB of ram and performance is good. Also it wouldn't hurt to download something like Onyx and have it run through an automated maintenance routine. The Hardware test doesn't determine if you have enough RAM for your needs lol Anyway, if you are doing anything more than web browsing when it is feeling slow, it is the RAM sending data to backing storage. No of course not. But what I mean is he's reporting a CPU performance dip that is only rectified by doing an SMC reset, his words, not mine. Granted 4GB of Ram isn't enough for what he's doing but surely it's a good idea to check things out just incase there is something worse going on? It probably is just the swap but it's better to be safe than sorry. Never hurts to be overly cautious.